I received an e-book of this from Bloomsbury via NetGalley. I also received a physical copy. Thank you to the publisher for giving me a chance to read and review this. First of all I just want to point out how beautiful the main cover of the book is. It is so pretty, and all the colours go well together. I actually wasn't expecting to like this book as much as I did. It's not the sort of novel that I warm to, but I decided to give it a chance, and I'm honestly glad that I did. 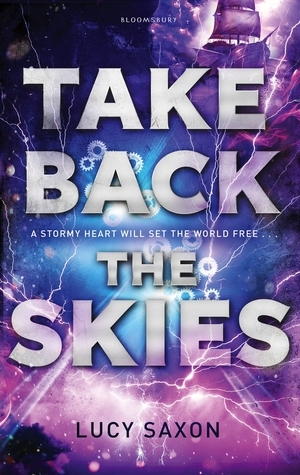 Take Back the Skies is a great adventure in the air. Fantastic characters and amazing bonds. Very animated characters. The only thing I didn't like was that there was a slight insta-love attraction between two characters. But it soon rubbed off on me! Cat is kind of tomboy-ish and really cool. Fox is the male version of Cat and very like-able. I found there were a lot of twists and turns that I didn't expect (especially the end!!). This book is an awesome start to a new series. It's written in second person, and the chapters are fairly short. I really like how there is a map in the front of the book. That is a very good aspect! You guys NEED to pick this book up! It's awesome, and that's why I gave it four and a half stars.